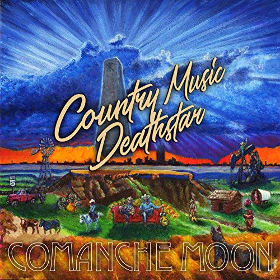 Not exactly a country music space opera, nor a full-blown concept record, Country Music Deathstar by Texas Panhandle country band Comanche Moon nonetheless makes a compelling argument for itself with an advanced and forward-thinking approach to country rock, while keeping the music and songwriting grounded in everything that’s great about authentic country music. 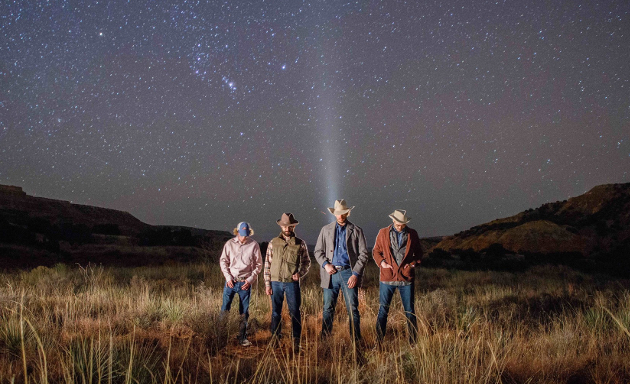 West Texas ain’t the cosmos, but it’s vastness and history have inspired many songs and artists over the years no different than gazes skyward at the celestial heavens. That’s why the region has consistently churned out some of the best songwriters and performers from the Lone Star State and beyond, and it’s also what makes Texas country a much more enriching alternative to whatever Music Row has cooking. This record leaves all the in-between stuff out, and instead focuses on the meaningful moments that go on to define us, like the current single of the bunch “Oilfield Blues.” Worrying over the tough decisions of buying a herd, selling your mineral rights, trying to scratch something out in the city, and subdividing the family land are the big choices the sons and daughters of farmers and ranchers have to wrestle with on a regular basis as the prairie succumbs to the churn of modernization. Mixed in there are the affairs of the heart, which makes the tough decisions that much more daunting. Being born on a ranch, you don’t just have your own dreams to tend to. You have the constant pull to keep the dreams of your family and ancestors alive via the land they built them upon. Produced by guitar player Tim Allen of Shane Smith and the Saints, and recorded at Yellow Dog Studios in Wimberley, Texas with Dave Percefull and Adam Odor, Country Music Deathstar is an album that pulls you in and imparts wisdom along with the entertainment. The band feels like a part-time endeavor for the members of Comanche Moon at the moment, but Country Music Deathstar is a full-time effort, surpassing in imagination and scope what many touring bands compile who perhaps are too preoccupied by the commercial application of their efforts to do something this expressive. That said, sometimes when you don’t choose a lane, you can get left behind or forgotten. Too country for rock, and too rock for country—or “Texicana” as Comanche Moon calls it—can create a wide appeal, or it can leave you struggling to find favor with either camp. Luckily for Comanche Moon though, they have songs, which is the trump suit in the increasingly garbled jungle of musical genre. “Comanche moon” is a common term in Indian country, taken from the propensity of Comanche war tribes to conduct their notorious raids with the aid of a full moon cycle. The Texas prairie turns downright lunar in the blue and grey glow of full moonlight, making men into apparitions, and mere topographical features into magical constructs. It sends the imagination churning, similar to listening to Country Music Deathstar. Mark Erickson is actually John Erickson’s son, who wrote Hank the Cowdog. TOTALLY IN FOR THIS. From the 2 examples here, it seems to me that the songwriting force is strong with this one. “The One That You Love” was on my playlist a couple of month ago. The song was a so-so hit in Texas (Texas Top 100). The album is good. The songs & production are solid. Not outstanding. My highlights: “The One That You Love” & the current single “Oilfield Blues” (#61 after 11 weeks). Great album, fine harmony vocals with highlights like the single “Ten Years”, “River Rolls” or “Joy & Misery”. Mainstream & radio friendly. My highlights: “Anymore”, the single “Leaving Midland” & the title-track. The single “Tailgate For Two” is a small hit in Texas. The album (& the voice of James Garland) is not as polished as the Tanner Fenoglio album. With a good producer a song like “My Remedy” could be a big hit. But not with the current producer. A typical Texas-country album. Nice tunes. Probably a good band to hear live. Had not heard about the Commanche Moon, so I looked it up. seems there’s a Texas writing style. Very descriptive. Like the reviews here. The band Comanche Moon also sounds good, need to spend some more time with the album. Yes! We named the band about a week after the first time I read Empire of the Summer Moon. I have some family history in that book. More importantly, it tells an important part of the story of our region. Hey Mark, that’s a great connection and influence for the band name. Much respect and thank you for sharing. Looking forward to listening to more of your album! thankyou, looks like an interesting book. I looked that up on Amazon- I will be getting it. I’d also recommend “Comanche Dawn” by Mike Blakeley, who is quite a story teller. His version is a romanticized fictional account of how the Comanche became the horsemen they are noted for being. Though it is fiction it is well written and a compelling read. Thanks for the recommendation, DJ, regarding the Mike Blakeley book. I’ll check it out. I also enjoy historical fiction (and fiction in general). I’m reading Comanche Moon now (coincidentally) by Larry McMurtry – part of the Lonesome Dove series. Really good, easy reading for long business trips. Really glad you enjoyed “Empire…” and I agree, we should all read it! Me too- is that supposed to have a #? LOL. I’ve read many Larry McMurtry books. He is good and should be considered great literature, IMO. When I saw Roger Creager the other night he mentioned having read Cadillac Jack. I have a mini-library that I hope my kids will keep and appreciate when I’m gone. Fiction, historical fiction. Right now I’m reading the Crazy Horse- Custer parallel- talk about interesting. My fiction likes has moved on to modern thriller and legal- there are some good stories out there making me have one regret in life: Not being a story teller. Excellent review Trig. It really piqued my interest in this album. I have no work or family obligations today so I’m going to my basement with some headphones to give it a thorough listen. Wow! These guys clearly know something about melody and great hooks. Their songs stick in your brain and refuse to leave. That song about going to the country puts me in mind of early Charlie Daniels Band. Not in terms of vocals mind you, but in terms of instrumental style and the fiddle solidifies it. Kinda southern rock in style. Great find Triggerman! Will be ordering the Cd this week, I lived in Lubbock in the early 80’s and now my daughter is attending Texas Tech as I did as well. Love West Texas, Palo Duro Canyon, love the music from that region, listen to it exclusively, new and old. Keep up the great work Mark and hopefully you guys will come up to NYC someday soon. And thanks Trig for the heads up! Not too bad at all. I also went and listened to “Oilfield Blues” and it was pretty cool.